Meansbusiness.com, is a great site with current information on all different aspects of business. The site has a learning center that headlines ten different business areas. The areas of subject are: organizing work and people, knowledge and learning, career development, sales and marketing, products and services, digital enterprise, internet economy, finance and profitability, strategy and competition, and leadership and change. Within each of these subjects, news editors scan over 100 prominent magazines, newspapers, journals, and web sites in search of the latest and most original business thinking. These ideas are selected for their originality, cogency, and relevance in today’s rapidly changing economy. This is a great site to find new and different ideas and approaches to today’s business. Moreover, the ideas in the news section of the learning center are published biweekly. The site www.entarga.com is a web site that looks at different approaches for planning for the future. Comprehensive business planning involves numerous, separate activities. The key to success is knowing not only how to implement each planning phase, but how they interact and build on each other. This web site details six planning approaches; strategic planning, leadership development, organizational learning, knowledge management, marketing planning, and a guide to prepare your own plan. This site is an excellent resource with great information dealing with strategy and planning of the future. The site is an excellent site to obtain information and bring new approaches to light when planning for a company. Another web site, mindtools.com, is a site that specializes in helping the user understand the essential skills and techniques that will enable them to excel in their career, whatever their profession may be. The site has two subject areas. The first is the creativity, problem-solving and management skills area. This area is broken down into five subjects: information and study skills, creativity tools, tools for mastering complexity, techniques for effective decision-making, and project planning and management skills. The second area deals with personal effectiveness skills. This area is broken down into four subjects: job-hunting skills, how to use time effectively – time management, techniques for controlling stress, and tools to improve your memory. Within the site, it recommends different resources to help fulfill each of the subject areas. These resources include books, web sites, computer programs, and consultants. Based at Harvard Business School, the Institute for Strategy and Competitiveness is led by Michael Porter, one of the most influential individuals in the study of strategy. The institute “studies competition and its implications for company strategy; the competitiveness of nations, regions, and cities; and solutions to social problems” (ISC Website, 2003). The institute’s website is located at http://www.isc.hbs.edu/. On their website, the institute provides a limited number of articles, but those that they do provide are very valuable to those who are studying strategy management. The institute also provides abstracts to many of the articles that they have published, a listing of speeches by their members, interviews, reviews, and much more. SAP webinars are an extension of the SAP user group, ASUG, and are very informative. I found the general nature of MMC’s website and articles helpful on a daily basis. The most recent one I used was to enhance my knowledge of fixed asset accounting approaches. A reference set would not be complete without one QUE manual – my dog-eared copy of this reference is in use weekly for some analysis or another. Chapter 13 deals with “Managing Scenarios”, and addresses how to use sensitivities on assumptions to study a particular business case for differing outcomes. This tool closes the loop on my original strategic reference in number I above, the Scenario discussion book. Carlberg, Conrad. 1995. Business Analysis with Excel. QUE Business Computer Library. Que Corporation, Indianapolis, IN. I subscribe to CFO magazine, a journal that also includes a quarterly CFO-IT issue. The provide up-to-date information about current topics, such as Sarbanes-Oxley regulation, CEO and CFO mandates to shareholders in the new SEC oversight world, and great case studies from companies of all sizes and disciplines. The Spring 2003 issue had a special section on strategy feedback software, or CPM, products, that use a form of balanced scorecard for feedback on how well the company is implementing strategy. One package, COGNOS, is interesting for a smaller company as it is more affordable than SAP or Oracle. However, the article does mention that SAP is certainly on the bandwagon to add a CPM (Corporate performance management) module. Since IGT has just added SAP system, I will be looking forward to using this tool in the future. CFO Magazine. Published monthly, with quarterly special topic issues. Published by CFO Publishing Corp, Boston MA. It is a subsidiary of The Economist Newspaper Group, Inc. 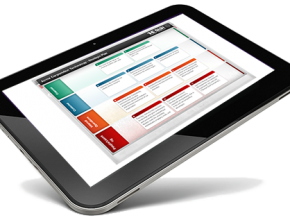 This Bain & Company website provides strategic planning for companies. Bain & Company launched a multi-year research project in 1993 to gather facts about management tools, and to track their use. The objective was, and continues to be, to provide managers with the information they need to identify, select, implement and integrate the tools that will improve bottom line results. Over the past eight years, Bain has assembled a database that now includes over 5,600 senior manager respondents from over 20 countries in North America, Europe, Asia, Africa and South America. This year’s results revealed that executives are opting for classic, “tried-and-true” management tools to address fundamentals of cost and corporate direction over “new economy” tools. “During a year when executives jumped on the Internet bandwagon to seek quick and easy growth, they found no new tool paved the road to riches,” said Darrell Rigby, founder of the Tools Survey. The most widely used tools cited by senior managers in 2000 remain the same as in 1999: Strategic Planning (76%), Mission and Vision Statements (70%), and Benchmarking (69%). In addition, the site provides the management tools for the site’s visitors free. For example, under Management Tools is a list with links to important words and terms utilized in management. When you click on the links, it provides a description and uses of each tool. The strategic management tool link on the site give you a description of what strategic planning is, the methodology, the common uses, and a list of selected references for the topic. Some of the other links on the page includes, balanced scorecard, core competencies, growth strategies, mission and vision statements, strategic alliances, and strategic planning. All of the links contain information on each topic that would be helpful to use as reference guide for business. CSSP is an organization that helps companies in determining the proper strategic course of action. This site is a great resource for strategic management gurus. In addition, you can join CSSP at no charge. By being a member you can have access to their Strategic Planning Newsletter, seminar information, and strategic planning book. The newsletter has strategic planning newsletters that apply to the business world. The seminar information link contains dates and times of upcoming seminars around the United States. The Simplified Strategic Planning book by Robert W. Bradford and J. Peter Duncan with Brian Tarcy is a link that is all about trying to sell site visitors the book. According to the site, the book is for Simplified Strategic Planning: A No-Nonsense Guide for Busy People Who Want Results Fast! The site also contains other links that include the company’s planning services, tools and resources, article archives for strategic management. This site is an on-line journal that offers great information on recent management and industry issues in strategic management in different industries. Furthermore, the site offers a monthly e-mail newsletter that gives you the ability to access all new articles. This was probably the most useful site that I found that was has all the business information linked into one site. There is a wonderful section on strategic management. This portion of the site gives you a resource, which outlines the fundamentals of game theory. Additionally, there are also strategic models found throughout the site, such as the ones from Porter. Ideas @ Work on the Air. The web site has an archive of radio programs that offers insights from leading management thinkers and professionals in business today. The information is based on articles in the Harvard Business Review, the Harvard Management Update, and Harvard Management Communication Letter newsletters. Many professional organizations are dedicated to optimizing strategic thinking. These organizations are located throughout the world. The Strategic Management Society, The Strategic Planning Society, and The American Management Association are few of the organizations available for interested parties. Activities and publications are common among these organizations. These functions and information include conferences, awards, list of reference sites, journals, and influential information. Allied Business Intelligence Inc is a well-respected New York-based technology research think tank whose findings influence the strategies of many large companies. The group states on their website: “ABI’s research has appeared in most of the major media sources of the world, such as The Wall Street Journal, The New York Times, The San Jose Mercury, The Dallas Morning News, The Economist, The Financial Times of London, and literally thousands of other sources.Nearly every technology company of the 30 firms that make up the Dow Jones Industrial Average – and over half of the NASDAQ 100 rely on research from ABI to assist them in their strategic planning and tactical marketing” (ABI, 2003). Even with the changing economy, companies are still looking to technology to expand into new marketplaces and improve operations. However, these projects require a significant expense and time in planning to implement the strategies. Allied Business Intelligence produces reports to aid companies in their strategic planning. For example, the company is presently featuring a story on whether “Hot Spots,” or areas where people with wireless networking hardware on their portable computing devices can access the Internet, are profitable. An example of a company that is betting that it will boost the sales of their products is Starbucks who has implemented Wi-Fi technology in many of their shops. Other examples of the types of reports on emerging technologies that the company produces are ones on fuel cells, semi-conductors, and speech recognition. The group not only predicts the success of new technologies, but also will identify potential markets for its use, which executives can use as a guide for their research and development spending. The Society of Competitive Intelligence Professionals is a global organization for those involved in the practice of collecting competitive intelligence. The society defines the term as the legal and ethical collection and analysis of information regarding the capabilities, vulnerabilities, and intentions of business competitors (SCIP, 2003). Those who form the strategies of their organizations rely on the competitive intelligence to determine the direction that their competitors are taking their companies and thus are able to better position themselves in the marketplace. The society produces conferences, “Webinars,” an online archive of articles related to the field, and a quarterly journal. Competitive intelligence is important to strategy formulation in that it allows a company to better determine the plans of other companies in the future marketplace. In some companies, there may only be one person who scans through websites looking for information, but a recent SMM/Equation Research survey of 291 sales managers revealed that 89 percent ask their salespeople to double as information agents (Neuborne, 2003). The society emphasizes in many places on their website that all methods that they develop and advocate are ethical. However, the downturn in the economy has caused some to violate ethical standards as seen in the recent cases of Oracle rummaging through Microsoft’s garbage and Princeton hacking into Yale’s scholarship computer (Neuborne, 2003). Strategy + Business (s+b) Magazine is a phenomenal resource published by the global management and technology consulting firm, Booz Allen Hamilton that has a readership of over 100,000. According to their website, “Alone among major business publications, s+b draws on a combination of journalists, academics, consultants, and corporate strategists to contribute articles that set the agenda for business leaders and guide them through its execution” (Strategy + Business, 2003). Rather than providing a single tool for strategy formulation, s+b provides articles and viewpoints on much of what is happening in the study of strategy. A look at the current issue shows the publications emphasis on strategy formulation with articles such as: “Symantec’s Strategy-Based Transformation,” “The Better Half: The Artful Science of ROI Marketing,” and “The Man Who Saw the Future” about the father of scenario planning. The magazine also archives their articles on their website giving free access to anyone who signs up for access. Booz Allen Hamilton is able to effectively advertise conferences and seminars through their website while providing users free access to their articles. Keeping up with current issues in strategy formulation is important to those interested in the field. Strategy + Business appears to offer the best source of changing trends in the field. A student named Robert Williams posted an Internet bulletin board asking for opinions with respect to strategic planning and policy implementation. Mr. Williams is asking people how much time and effort should be afforded for contingency planning. I think this is a great resource for information and a good approach to get opinions from different people that are involved in strategic planning. Bulletin boards provide you with positive and negative feedback that will enable you to use the best methods for planning your strategies. The fifth example for this homework is an advertisement from JAE Enterprises, Inc. JAE Enterprises is a business-consulting firm, specializing in developing organizations through grant writing, fundraising and business planning. This firm can help companies to decide or establish strategic plans. Most of the strategic plans for a company must lead you to success. Firms like JAE Enterprise can advise you what strategies used by other companies that have lead them to failure. They have data that supports their recommendation for the use of a particular strategy. The management professor writes the strategic management site from the University of Rhode Island named Robert Comerford and Dennis Callaghan. The website contains an abundance of information on strategy. The site has six chapters that include topics on the introduction of strategic management, environmental, industry, and internal analysis, strategy formulation, strategy evaluation, functional strategies, and strategy implementation, and control. Each chapter has detailed information on each topic. Chapter 1 has information regarding the evolution of strategic management, strategic management effectiveness. Then, Chapter 2 provides detailed information on how to conduct an environment, industry, and internal analysis. Chapter 3 explains how strategy formulation works. This chapter tells one how to create proper goal formulation and action plans for strategy. One helpful table I found in this chapter is on the following page. Next, chapter four gives techniques on how to evaluate and select strategies, such as strategies for each portion of the product’s or service’s life cycle.. Chapter five contains information on functional strategies and how to implement strategy. Finally, chapter 6 provides strategy implementation and control. The site has information on the types of strategy implementation and control. Plus, the site has links to appendixes that have information on analyzing and writing cases, sources of business information, merger strategy, and global strategy choices. This site gives you an overview on the book by Robert M. Grant is Professor of Management at Georgetown University and at City University, London. His research includes corporate diversification, organizational capabilities and knowledge management, and strategic and organization change within the oil and gas industry. The site contains summaries about each of the five parts of the book. Part I is titled, “The Concept of Strategy”‘, Part II is called, “Tools of Strategic Management”, Part II titled, “The Analysis of Competitive Advantage”, Part IV is, “Business Strategies in Different Industry Context”, and Part V is named, “Corporate Strategy”. Each link goes into detail about what the chapter contains. Also, the site has helpful links to related books and titles on strategy, slides, and sample chapters of the book. A Google™ search for “Six Sigma” (in quotation marks) yields 73 pages of results showing the popularity of this methodology. In evaluating tools for strategy formulation, one must consider what has been successful in other companies. Jack Welch, the former CEO of General Electric, openly endorsed Six Sigma and GE’s success with it inspired many other Fortune 500 companies such as 3M, Home Depot, and Ford to adopt the strategic methodology (Barakat, 2002). Started at Motorola in the 1980s, Six Sigma, which translates into 3.4 defects per million opportunities, uses a variety of statistical models to measure the company’s performance on a slew of internal processes (Barakat, 2002). The reason that this management system is being included as a tool for strategy formulation is because of its implications for company strategists. To adopt the program, there is a significant cost to the corporation to hire or train quality experts, namely the green and black belts. The strategy of the corporation will be adjusted based on the statistical analyses of the company’s processes. Since it became popular, Six Sigma philosophies have been adapted to other industries outside of manufacturing. For example, Fort Wayne, Indiana claims that it was Six Sigma management practices that have improved the response time of their public works department, which now patches 95% of all of the city’s potholes within 24 hours of being reported. In contrast to the last two tools, the article “The New Strategy and Why It Is New” is not based on the past successes of other companies. This article, available on the Strategy + Management website at http://www.strategy-business.com/press/article/?art=24966&pg=0, discusses how strategy formulation is a now a more integral part of the management process rather than a traditional annual event as it was in the past (Demos, Chung & Beck, 2001). Part of the change, according to the authors, is the changing competitive market. Previously, companies would compete with individual companies, but modern companies have formed so many strategic alliances that competitors must now consider the teams of competitors when creating strategy (Demos, Chung & Beck, 2001). The article also discusses the need for company strategies to be dynamic to adapt to the rapidly changing market (Demos, Chung & Beck, 2001). As part of this need, the authors discuss strategic business transformation, which also involves the option horizon and adaptation round. Strategic business transformation is defined as the semi-continuous changing strategy of a company. The option horizon “requires using the traditional tools of strategic analysis – gaining insight into the economics of competition in relation to the fulfillment of customer needs, searching for opportunities to reduce costs, choosing the right technologies, and determining appropriate levels of vertical integration” (Demos, Chung & Beck, 2001). Lastly, to explain the concept of adaptation round, the authors state: “Once the next games are defined, the company must adapt to win them, navigating the path from now to then while protecting the value of the existing franchise” (Demos, Chung & Beck, 2001). Van der Heijden, Kees. 1996. Scenarios – The Art of Strategic Conversation. John Wiley & Sons., Chichester, West Sussex, England. Kees van der Heijden was instrumental in guiding Shell Oil in its use and development of strategies for business development. I had first hand experience with Shell’s approach when I was a Senior Project manager for Mobil Oil, and I was part of several joint ventures with Shell both in the United States and Europe. We had quarterly meetings to review and develop scenarios centered around deep sea oil field expansion. The book develops from a discussion about why planning is necessary. The points are made that up-front investment in planning may avoid the need to think through a crisis situation from scratch in the heat of the moment. Planning provides a path that guides all stakeholders in a common direction, and provides a memory or learning system so mistakes are not repeated. Kees then presents the principles of scenario planning, where he pulls in SWOT analysis with the overall mission or aim of the business, and the development of policies from that assessment. The most useful part of the book to me part three, which covers the practice of scenario planning. He completely covers the steps from the initial interview, through gathering of data, performing analyses, and development of scenarios and options. He concludes the book with tips on how to institutionalize, or cascade, the use of scenarios throughout an entire organization.